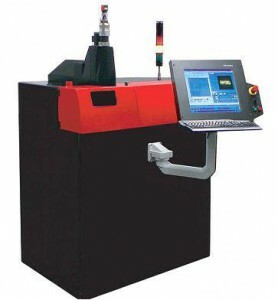 There are three main configurations of industrial 2D Laser systems. Moving X-Y tables have a stationary cutting head and move the material under them. This method provides a constant distance from the laser generator to the workpiece and a single point from which to remove cutting effluent. It requires fewer optics, but requires moving the workpiece, which can be an issue for large or heavy items. Hybrid Lasers provide a table which moves on one axis (usually the X-axis) and moves the head along the shorter (Y) axis. As a result, a more constant beam delivery path can be achieved than a flying optic laser system, leading to reduced power loss in the delivery system and more capacity per watt. 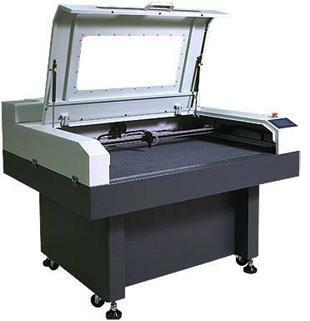 Flying optics Laser systems feature a stationary table and a cutting head (with Laser beam) that moves over the workpiece in both of the horizontal dimensions. Flying optics cutters keep the workpiece stationary during processing and often don’t require material clamping. The moving mass is constant so dynamics aren’t affected by varying size and thickness of the workpiece. Flying optics Laser systems are the fastest class of machines with higher accelerations and peak velocities than hybrid or moving material systems. Flying optic machines must use some method to take into account the changing beam length from near-field to far-field cutting. Common methods for controlling this include collimation, adaptive optics or the use of a constant beam length axis. For all these systems, the axes of motion are typically designated as the X and Y axes, for the long and short direction of travel respectively. If the height of the cutting head over the workpiece may be controlled, it is designated as the Z-axis. Similar principles apply to five and six-axes Laser systems, which permit the cutting of formed workpieces. There are various methods of orienting the Laser beam to a shaped workpiece, maintaining a proper focus distance and nozzle stand-off, etc. For 3D cutting applications the process head from a Fiber Laser can be mounted on an industrial robot. Full flexibility in the movement of the robot is provided by using a fibre optic beam delivery system. These are usually moving optic Laser systems, though some used for larger sheets are hybrid. Metal cutting speeds depend on the edge quality required and the type of material. Typically, cuts will be at a few m/min for material around 6mm thick, increasing to around 10m/min for 2mm thick steel. Most sheet metal applications can be addressed with a system using a Fiber Laser. 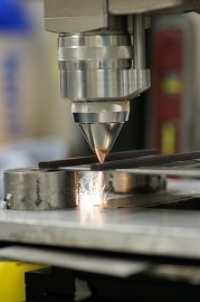 Fiber Lasers are increasingly popular technology for Laser metal processing applications. Lower powered Fiber Lasers (such as our redENERGY range) are highly suited for thinner sheets (sub-mm thickness), for example, cutting solder paste screens used in manufacture of printed circuit boards. Typically these screens are made from 0.2mm stainless steel. Higher powered Fiber Lasers such as the redPOWER range of Lasers can cut 15mm low carbon steel, 6mm aluminium alloys and 10mm stainless steel. The advantages of Fiber Lasers are their better efficiency, lower consumable costs and much lower process gas cost. Specialised tube cutting systems are generally the hybrid type. The tube is rotated under the Laser beam, which moves along the tube in the cutting area. Tube cutting systems are commonly used in the manufacture of medical stents. These highly detailed tubes are designed to be inserted into blocked arteries. Made from small diameter (~1mm) tubes, they demand very high precision cutting and low levels of dross. Dedicated Laser systems for this application deliver high accuracy cutting, using a fixed beam delivery point while rotating and feeding the tube longitudinally through the Laser focus. When 3D components need to be cut, a robotic arm can be used to direct the Laser output. The ability to easily integrate our Lasers with existing robots is particularly attractive to the automotive industry as it allows capital investment to remain relatively low while providing versatility and redeployment for future needs. Hydroformed and rectangular cross-section tubes have become popular for truck and SUV frames, engine cradles, roof pillars and suspension members. The ability to achieve high stiffness, exotic shapes, and minimal weight from these structures will drive these applications to even more platforms. For the manufacturer, the challenge is cutting these closed tubes with only single-sided access. In the past, parts were produced from folded and spot-welded assemblies that could be punched easily with conventional tooling as flat sheet prior to forming. Laser robotic cutting cells with fiber-delivered Laser beams have proved helpful in this area and end users are looking to Laser robot systems for option holes, short-run productions and prototype systems in sheet metal parts. A new cutting format that has been made possible with the advent of excellent beam quality Fiber Lasers, is the use of a galvanometer scan head to enable the very high speed cutting of thin metal sheets and foils over a scan area approximately 100mm square.